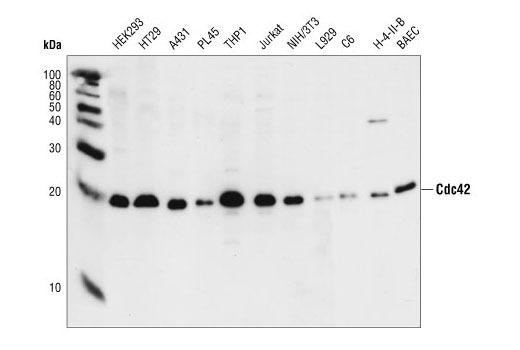 Western blot analysis of HEK293, HT29, A431, PL45, THP1, Jurkat, NIH/3T3, L929, C6, H-4-II-B and BAEC cells, using Cdc42 Antibody. Cdc42 Antibody detects endogenous levels of total Cdc42 protein. The antibody does not cross-react with other small GTPases. Polyclonal antibodies are produced by immunizing animals with a synthetic peptide corresponding to residues surrounding Lys135 of human Cdc42. Antibodies are purified by protein A and peptide affinity chromatography. Rac and Cdc42 are members of the Rho-GTPase family. In mammals, Rac exists as three isoforms, Rac1, Rac2 and Rac3, which are highly similar in sequence. Rac1 and Cdc42, the most widely studied of this group, are ubiquitously expressed. Rac2 is expressed in cells of hematopoietic origin, and Rac3, while highly expressed in brain, is also found in many other tissues. Rac and Cdc42 play key signaling roles in cytoskeletal reorganization, membrane trafficking, transcriptional regulation, cell growth and development (1). GTP binding stimulates the activity of Rac/Cdc42, and the hydrolysis of GTP to GDP through the protein's intrinsic GTPase activity, rendering it inactive. GTP hydrolysis is aided by GTPase activating proteins (GAPs), while exchange of GDP for GTP is facilitated by guanine nucleotide exchange factors (GEFs). Another level of regulation is achieved through the binding of RhoGDI, a guanine nucleotide dissociation inhibitor, which retains Rho family GTPases, including Rac and Cdc42, in their inactive GDP-bound state (2,3).